This winter I posed a question on Facebook asking our readers to name their favorite tomato varieties. I was ordering seeds and we were finalizing our Incredible Edibles list. ‘Cherokee Purple’ and ‘Sungold’ were popular, along with many other heirlooms. Then someone posted a question: are we going to be selling ‘Iron Lady’ tomato plants? I immediately set about researching this variety. It was developed at Cornell University to be resistant to early blight, late blight, and Septoria leaf spot- three fungal diseases that can destroy your tomato crop. Because organic farmers did not want to have to constantly spray with copper to control fungus problems (excess copper is not good for soil life), scientists worked very hard to breed a superior resistant variety. Welcome ‘Iron Lady’! I tried to stock the seed on our rack, but the only organic seed supplier (High Mowing) didn’t offer packets for our racks. I called them to ask why. They told me the seed was so expensive that a packet would only have a few seeds in it. I tried to buy it from their RETAIL website but they were sold out. I persisted and finally was able to purchase 200 seeds (for a small fortune I might add). We have contracted with our growers to grow lots of ‘Iron Lady’ tomatoes for Natureworks. You can use the Incredible Edible order form to reserve plants which will be arriving in mid-May. 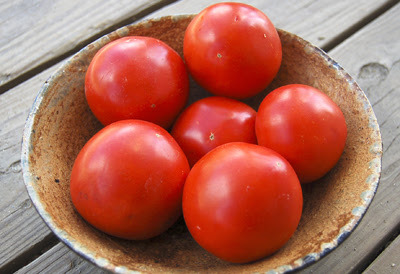 This is a medium sized red tomato, ideal for the home garden. Thank you Facebook fans for turning me onto this great new development in organic tomato growing.